Fairfield County’s Community Foundation announced the launch of the new Fairfield County’s Giving Day WHY I GIVEvideo contest to give nonprofits participating in Giving Day the opportunity to truly sizzle, spread their message and create awareness for their missions. In case raising over $1.4 million in 24 hours wasn’t exciting enough, the Community Foundation is determined to increase the momentum and excitement of this event even further. They have created an opportunity for nonprofits to shine even brighter and for you to help.
. Spread the word! Get your Facebook fans and followers to “Like” your video. The video with the most likes will win! 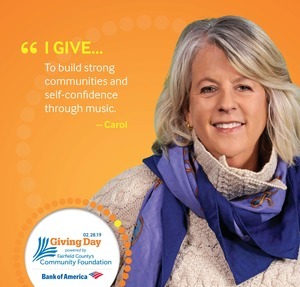 Fairfield County’s Giving Day is made possible through generous contributions from local businesses and individuals. For information on sponsorship opportunities, contact Mike Rosen, Fairfield County’s Community Foundation’s Chief Revenue and Business Development Officer at 203.750.3242.